Are you prepared for the great zombie invasion? Make sure that you have a box or two of zombie's Z-Max ammo in your bug out bag designed especially for putting Zombies in their place. 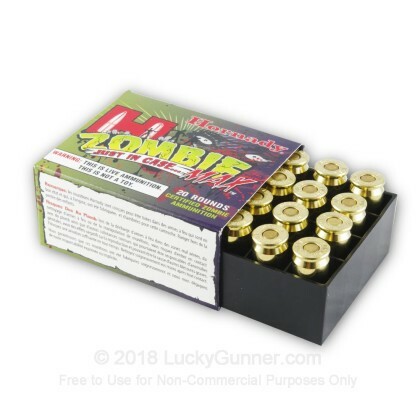 When the Zombie apocalypse comes you can rest assured knowing that you have ammo designed especially for penetrating zombie skin. This live ammunition is not a toy. It is quality made 45 Auto ammunition by Hornady who has a proven reputation for producing some of the finest ammunition in the land. This Z-Max pistol ammunition is built off of the foundation of Hornady's Critical Defense line...and then tweaked for zombies. Each round is rolled in an inspector's hand looking for imperfections prior to final packaging to ensure that the reliability that you have come to expect is maintained. This ammo is brass-cased, boxer-primed, and reloadable. Since this is basically the same thing as Critical Defense, for a couple bucks less, I call it a win. My wife and I have settled into carrying Hornady Critical Defense, Z-Max, or Critical Duty in her FNP45 Tactical and my M&P45c. They all three run reliably, and have tested very well for stopping power, even if the FNP45 does favor the hotter loadings. This ammo is very accurate and functioned flawlessly in my Kimber. This is a nice alternative to the 230 grain standard. The marketing and packaging is fun, however I think the ammo is a serious self defense load. I just placed an order for another box. Good job Hornady, and thanks Lucky Gunner! These are almost identical to the Critical Defense line except for the brass case instead of nickle plated ones. I tested some in wet books out of a Glock 21 and the expansion was most impressive. It outperformed a Hydra-Shok in expansion. The only bullet to come close to it in expansion is Corbon DPX solid copper 160 grain (non +P). This round is a devastating defense round and I recommend it in any 45 acp firearm and especially in short barreled ones. It would prove most formidable in a long barrel carbine as well. 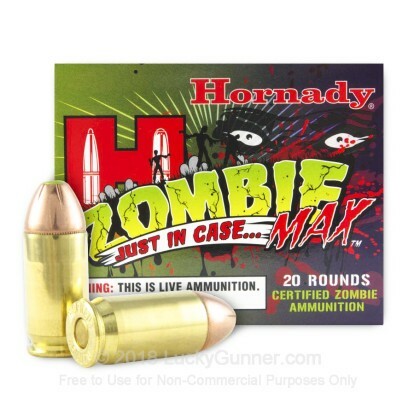 This is the same Hornady ammo they sell in the 185 grain pack, with the red tip, they just made this tip Zombie green. It's still quality ammo, accurately and deadly. The idea of the tip in the hollow point makes a difference and gets further into soft tissue without expanding too quickly. Good ammo from a good distributor. Wow, I can honestly say that I haven't ever had ammo that made Zombies heads explode better. I will never pack anything other than this ammo. Zombie invasions are becoming more and more common these days and you don't want any cut rate ammo in your trusty .45. Leave the ball ammo at home, this ammo literally decapitated 7 out of 10 Zombies in my last attack! 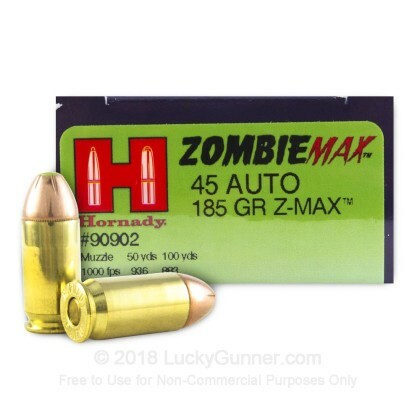 Q: Is 45 ACP 185 grain jacketed hollow-point Zombie Max the "same" as Critical Defense only with a green plug instead of a red plug? A: This is correct. Hornady has simply changed the color of their plugs and designed a unique box for your zombie defense needs. This ammo is loaded with the same high quality components and performance you expect from Hornady ammunition.